Citation: Sahu K. Closed Mitral Valvotomy Versus Balloon Valvoplasty: A Prospective Comparative Study Of 100 Cases. Health Sci J. 2016, 10:1. Introduction: A prospective study to compare the result of closed mitral valvotomy with percutaneous balloon valvoplasty in 100 cases (50 patients in each group) of rheumatic non calcific mitral stenosis. Methods and Result: From November 2009 to March 2010, 50 patient underwent closed mitral valvotomy and another 50 had percutaneous balloon mitral valvoplasty. Balloon mitral valvoplasty was performed by Inoue technique and closed mitral valvotomy was carried out through standard anterolateral thoracotomy with transventricular gradual Tubbs dilatation.Functional status, left atrial size, transmitral end diastolic gradient, mean diastolic gradient and mitral valve area were recorded. The results at the 4-day post procedure and the results at the 6-month follow-up were compared. Residual atrial septal defect(ASD) was present in 6 patient at 6 month follow-up after balloon mitral valvoplasty . Severe mitral regurgitation occurred in 3 cases of closed mitral valvotomy group as compared to 7 cases of balloon mitral valvoplasty group. Urgent mitral valve replacement was needed in 2 patient of balloon mitral valvoplasty group. There was one mortality in both groups. Conclusion: No statistical significant difference between the result of closed mitral valvotomy and balloon mitral valvoplasty but better outcome obtained by closed mitral valvotomy . Hemodynamic and functional improvement was sustained through 6- month of follow-up. Procedural cost of closed mitral valvotomy is significantly lower than the procedural cost of balloon mitral valvoplasty. Closed mitral valvotomy; Balloon mitral valvoplasty; Rheumatic non calcific mitral stenosis. Treatment of rheumatic mitral stenosis ranges from conservative medical management to closed mitral valvotomy and the more recent balloon mitral valvoplasty. Improvement of symptoms after closed mitral valvotomy was demonstrated many years ago [1-3]. Refinement in technique and the routine use of metal dilator have produced sustained clinical improvement at low risk. Percutaneous balloon mitral valvoplasty evolved from balloon valvoplasty for pulmonary valve stenosis. This prospective study was designed to compare the result of closed mitral valvotomy with balloon mitral valvoplasty over a period of 6 month. From November 2009 to March 2010, 100 consecutive patients with rheumatic non calcific mitral stenosis were assigned either closed mitral valvotomy r balloon mitral valvoplasty procedure according to their will and financial condition. The mitral valve orifice area was determined by planimetry method on Doppler echocardiography. Fifty patient underwent closed mitral valvotomy by standard transventricular Tubbs dilatation. The Tubbs dilator was extended a minimum of 2.5 cm and maximum of 3.5 cm. Fifty patients underwent balloon mitral valvoplasty by the Inoue balloon technique. Patient undergoing balloon mitral valvoplasty were managed by cardiologist in the cardiac care unit and those undergoing closed mitral valvotomy were managed in the post operative intensive care unit. Post procedural two dimensional Echo Cardiography was performed on fourth post procedural day, with follow-up echocardiography after three month and six month. On follow-up the patients were also assessed for cardiac rhythm, New York Heart association (NYHA) functional class, medication and the presence or progression of the same or other valvular lesion. Two patients out of 50 patients of closed mitral valvotomy group and 2 patients out of 50 balloon mitral valvoplasty group lost to follow-up after one week. One more patient lost to followup because he met with an accident and died. Procedure cost of closed mitral valvotomy is significantly lower than the procedure cost of balloon mitral valvoplasty. Analysis of variance for repeated measures was used to assess baseline and follow-up date for change over time and for the effect of treatment. If the analysis of variance indicated statistical significance, it was followed by comparisons within groups by use of paired student's t test and comparison between groups by use of unpaired student's t test. All tests were two sided to adjust for multiple testing, a p value less than 0.005 was specified as indicating significance. Results are reported as mean ± standard deviation(SD). Of these 100 patients, 58 were female and 42 were male. Lowest age in closed mitral valvotomy group was 15 years and maximum age was 65 years. Lowest age in balloon mitral valvoplasty group was 12 years and maximum was 64 years (Table 1). All the patient of balloon mitral valvoplasty and closed mitral valvotomy group had rheumatic non calcific mitral st1enosis. There was fall in transmitral end diastolic gradient and mean diastolic gradient in both groups of patient, determined by Doppler echocardiography fourth day after procedure. End diastolic gradient were 5.88 ± 2.64 (mm Hg) before closed mitral valvotomy and 7.46 ± 3.7 (mm Hg) before balloon mitral valvoplasty. After closed mitral valvotomy and balloon mitral valvoplasty they decreased significantly to 1.65 ± 1.22 (mm Hg) and 1.99 ± 1.2 (mmHg) respectively. Mean diastolic gradient before closed mitral valvotomy was 16.38 ± 4.3(mmHg) and before balloon mitral valvoplasty it was 17.32 ± 5.63(mmHg).After closed mitral valvotomy and balloon mitral valvoplasty, mean diastolic gradient was 4.85 ± 1.74mmHg and 5.54 ± 1.48(mm Hg) respectively. Table 1: Preprocedural clinical data. Continuous variables are expressed as mean ± S.D.(range). NYA, New York Heart Association functional class. Comparison of differences between treatment groups are all nonsignificant. Mean left atrial(LA) size before closed mitral valvotomy and balloon mitral valvoplasty were 45.21 ± 6.88(mm) and 45.67 ± 6.58(mm), decreased to 39.71 ± 5.92 (mm) and 40.02 ± 5.64(mm) respectively. Mean mitral valve area before closed mitral valvotomy and balloon mitral valvoplasty were 0.81 ± 1.5(cm2) and 0.78 ± 0.15(cm2), after procedure it increased to 1.97 ± 03.5(cm2) and 1.57 ± 0.28(cm2) respectively. However there was no significant difference (p>0.05) attributable to the type of the procedure. Thirty eight patients had post balloon mitral valvoplasty residual atrial septal defect at 4 day post procedure (Table 2). At the end of the study there were six (13.6 %) patient with residual atrial septal defect. No event of myocardial infarction occurred in either group. No event of reexploration occurred in closed mitral valvotomy. Table 2: Result at 4 days post- procedure. NYHA ,New York Heart Association functional class. Comparison of differences between treatment groups are all nonsignificant. At 6-months follow-up improvement occurred in both groups (Table 3). End diastolic gradient was 1.48 ± 0.654 mmHg in closed mitral valvotomy group and 1.76 ± 0.84 mm Hg in balloon mitral valvoplasty group. Mean diastolic gradient was 4.32 ± 1.01 mmHg in closed mitral valvotomy group and 4.72 ± 1.16 mmHg in balloon mitral valvoplasty group(p>0.05).Mean mitral valve area in closed mitral valvotomy group was 1.92 ± 0.47cm2 and was 1.54 ± 0.25cm2 in balloon mitral valvoplasty group (p>0.05).There was decrease in mean left atrial size after 4 day follow-up from 39.71 ± 5.92 mm to 37.41 ± 5.44 mm in closed mitral valvotomy group and from 40.02 ± 5.64 mm to 35.52 ± 6.7 mm after 6 month follow-up. 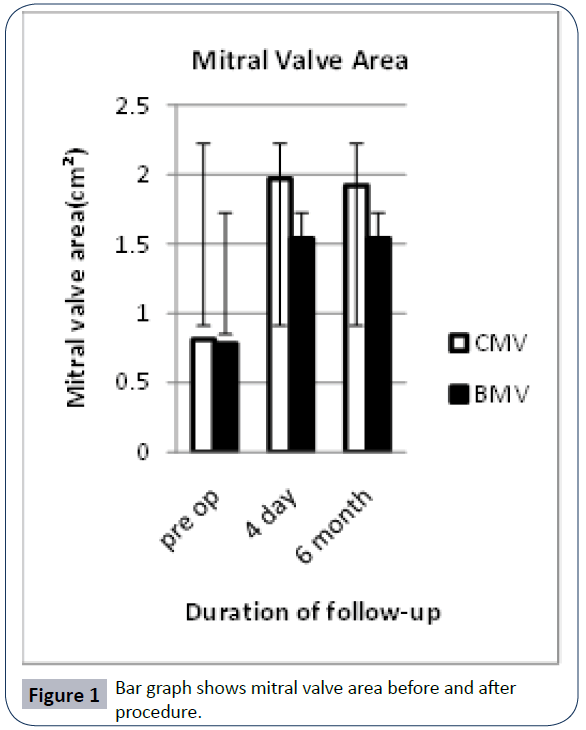 There was no significant difference between the group at 4-day or 6-month follow-up (p>0.05). Table 3: Result at 6 month post-procedure. Post procedure mortality in closed mitral valvotomy was one due to severe icterus and renal failure. This patient had preoperative icterus. After seventeen days of procedure she developed anuria and could not be saved inspite of vigorous try. One death occurred in balloon mitral valvoplasty group due to post procedure severe mitral regurgitation and pulmonary edema. One closed mitral valvotomy done on the patient with dextrocardia with good outcome. Closed mitral valvotomy done on two patients with 6 month pregnancy with good result and good fetal outcome. Urgent mitral valve replacement was needed in 2 patients of balloon mitral valvoplasty group after procedure. There was no need of mitral valve replacement in closed mitral valvotomy group. At the 6 month follow-up, 42 patients out of 45 who had closed mitral valvotomy were in sinus rhythm and 3 were in atrial fibrillation.40 patient were in NYHA class I ,1 was in class II and 3 were in class III (Table 3). All these patient were taking oral digoxin and diuretics. None had progression of mitral stenosis and Echocardiographic score. Of the patient undergoing balloon mitral valvoplasty, 42 were in sinus rhythm and 2 were in atrial fibrillation at 6 month followup. Thirty six patients were in NYHA class I and 7 were in class II. All these patient were taking oral digoxin and diuretics. Three patients who had mitral valve replacement were taking oral anticoagulant. Of the closed mitral valvotomy group one patient had closed mitral valvotomy done previously. Three patients had closed mitral valvotomy and one patient had balloon mitral valvoplasty done previously in balloon mitral valvoplasty group. A number of previous studies of closed mitral valvotomy and balloon mitral valvoplasty have been reported. Beg and Reyazuddin  reported favorable results after closed mitral valvotomy in 45 cases of mitral stenosis in childhood and adolescence. The majority of their patients presented with dyspnea and palpitations. In a study by Gautam and Coulshed,  better long-term survival was noted for mitral valvotomy with the Tubbs dilator compared to finger splitting, and the presence of calcification at the time of valvotomy adversely affected survival. They concluded that closed mitral valvotomy gave good results before the onset of atrial fibrillation and congestive cardiac failure, and that all patients should have anti-coagulation. In a randomized comparative study of the immediate and longterm results of balloon mitral valvoplasty and closed mitral valvotomy, both procedures were found to be comparable in respect of postoperative functional status, restenosis, and mitral valve areas . Another report concluded that optimal results of balloon mitral valvoplasty can be expected in patients with sinus rhythm and pliable valves with no severe subvalvular disease identified by echocardiography who undergo dilatation with large effective balloon dilating areas . Patients with suboptimal results were more likely to have severe valve leaflet thickening and calcification on echocardiography. Reporting cardiac catheterization after 8 months of follow-up in 92 patients, Turi and colleagues  found sustained improvement in a young population (mean age, 27 years) with a mean echo score of 7 and no difference in early or intermediate results between balloon valvuloplasty and closed or open commissurotomy. Two dimensional Echocardiography was used for assessment of mitral valve area, left atrial size, end diastolic gradient and mean diastolic gradient in this study. Three mechanisms account for the results of balloon valvuloplasty: commissural splitting; stretching of the commissural orifice; and cracking of valve leaflet calcification. Radiographic analysis of 15 operatively excised valves subjected to balloon dilatation demonstrated primarily commissural splitting, whereas an intraoperative study of the effects of balloon dilatation demonstrated a significant early benefit from commissural stretching . Because fusion of the commissures is the typical etiology of mitral stenosis in young patients, commissural splitting provides exceptional results . In spite of the initial optimistic pronouncement that balloon mitral valvoplasty would significantly improve care for rheumatic valve disease in developing countries, the low cost and equally good results of closed mitral valvotomy make it the procedure of choice in many parts of the world where valvular heart disease is prevalent, and ours is no exception . Closed mitral valvotomy is safer than the balloon mitral valvoplasty in mid term gravida patient as no hazard of radiation exposure to the fetus. No statistical significant difference between the result of closed mitral valvotomy and balloon mitral valvoplasty but better outcome obtained by closed mitral valvotomy (Table 2 and 3). The improvement in functional and hemodynamic status was sustained through 6 month of follow-up. Largest mitral orifice area of 2.8 cm2 achieved by closed mitral valvotomy procedure as compare to balloon mitral valvoplasty (2.2 cm2).Procedural cost of closed mitral valvotomy is significantly lower than the procedure cost of balloon mitral valvoplasty. Although the duration of hospital stay was appreciably less in the balloon mitral valvoplasty patients. Mitral valve orifice area, transmitral end diastolic gradient , mean diastolic gradients, left atrial size and functional status, in both groups showed remarkable improvement at the 6-month follow-up (Figures 1-4) with no patient having recurrent mitral stenosis. Closed commissurotomy is the most common surgical procedure in most countries where rheumatic mitral stenosis is endemic, where there are limited facilities and resources, closed mitral valvotomy is by far the less costly procedure. Balloon mitral valvoplasty is a costly but less invasive procedure. Figure 1: Bar graph shows mitral valve area before and after procedure. Figure 2: Bar graph shows end diastolic gradient before and after procedure. Figure 3: Bar graph shows mean diastolic gradient before and after procedure. 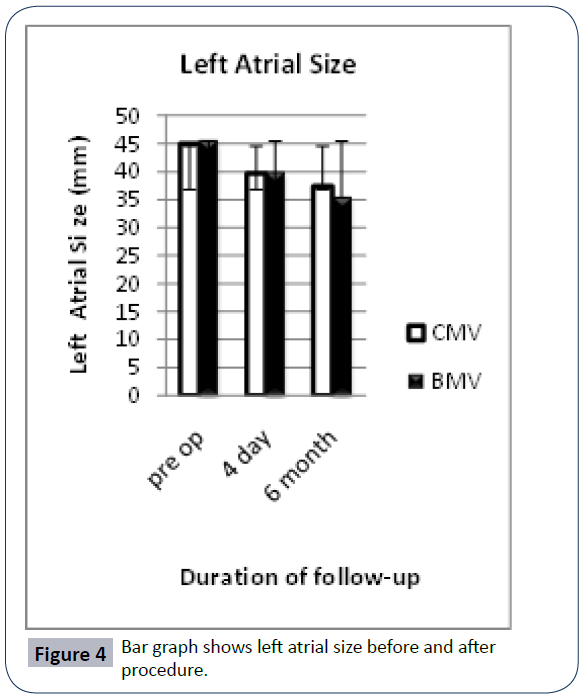 Figure 4: Bar graph shows left atrial size before and after procedure. Harken DW, Ellis LB, Ware PF, Norman LR (1948) The surgical treatment of mitral stenosis. N Engl J Med 239: 801-803. Bailey CP (1949) The surgical treatment of mitral stenosis (mitral commissurotomy).Dis Chest 15: 377-397. Baker C, Brock RC, Campbell M (1950) Valvulotomy for mitral stenosis; report of six successful cases.Br Med J 1: 1283-1293. Beg MH, Reyazuddin (1989) Mitral stenosis in childhood and adolescence--a study of 45 cases and their surgical management.Ann Trop Paediatr 9: 98-101. Gautam PC, Coulshed N, Epstein EJ, Llewellyn MJ, Vargas E, et al. (1986) Preoperative clinical predictors of long term survival in mitral stenosis: analysis of 200 cases followed for up to 27 years after closed mitral valvotomy.Thorax 41: 401-406. Arora R, Nair M, Kalra GS, Nigam M, Khalilullah M (1993) Immediate and long-term results of balloon and surgical closed mitral valvotomy: a randomized comparative study.Am Heart J 125: 1091-1094. Herrmann HC, Wilkins GT, Abascal VM, Weyman AE, Block PC, et al. (1988) Percutaneous balloon mitral valvotomy for patients with mitral stenosis. Analysis of factors influencing early results.J Thorac Cardiovasc Surg 96: 33-38. Turi ZG, Reyes VP, Raju BS, Raju AR, Kumar DN, et al. (1991) Percutaneous balloon versus surgical closed commissurotomy for mitral stenosis. A prospective, randomized trial.Circulation 83: 1179-1185. 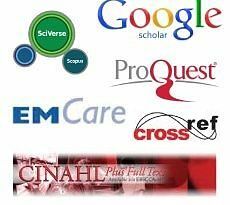 Kaplan JD, Isner JM, Karas RH, Halaburka KR, Konstam MA, et al. (1987) In vitro analysis of mechanisms of balloon valvuloplasty of stenotic mitral valves.Am J Cardiol 59: 318-323. Benedetti M, Biagini A, Anastasio G, Maffei S, Levantino M, et al. (1990) Evaluation of in vivo morphological results of balloon mitral valvotomy.Eur J Cardiothorac Surg 4: 337-340. Roberts WC (1988) India and Indian cardiology.Am J Cardiol 62: 1326-1329.